Different types of paganism were professed in the 4th century, and equally diverse were the forms taken by the support given to Julian. There were devoted pagans who fasted, practiced sacrifice and divination with great zeal, who took ritual baths and made pilgrimages to the best-known sanctuaries; who were attentive to all divine warnings, dreams, mystical signs, miraculous cures, and to all the various manifestations of divine benevolence; who believed in exorcisms and in the divination of the future with the help of mirrors. Julians reign was too short to allow us to formulate plausible assumptions on how his relationships with the adherents of paganism would have evolved in the long term. His religious position was essentially a personal one, not of a political nature. As soon as he became emperor, he recruited a large number of his most trusted friends and teachers to his project of restoring paganism. But it was precisely this project, given the peculiar character of Julians ideas concerning Hellenism and Hellenic culture and religion, that was the cause of discord and division. Julians reign provoked an articulated response at all levels. First of all, it was a period of restoration in the strict sense of the word: After a decade of neglect, the temples were restored, even though Julians untimely death prevented their complete renovation. 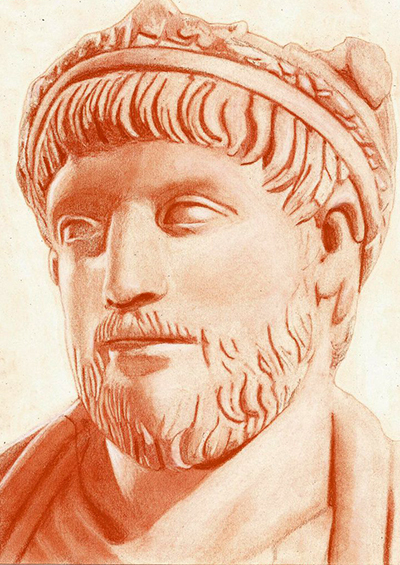 What is peculiar to Julian is his total refusal to negotiate in any way, as is proven by his dangerous decision to ban Christians from teaching the Greek classics, since he was well aware that Christian intellectuals were deeply immersed in Greek culture and highly valued it. Julians plan was to associate Greek culture (Hellenismos) exclusively with paganism so that Christians, to remain consistent with themselves, would need to reject them both.